Syllabus of the Online Course (Subject): South Asia Subregional Economic Cooperation (SASEC). Description of the Online Course: South Asia Subregional Economic Cooperation. One of the objectives of the South Asia Subregional Economic Cooperation (SASEC) is to facilitate the cross-border movement of products and people. 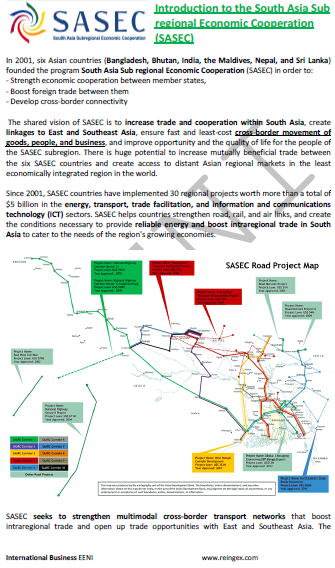 The South Asia Subregional Economic Cooperation (SASEC) has developed thirty-three projects (6 billion dollars) in ICT, foreign trade facilitation, regional transport, and energy. The Transport Sector Strategy of the South Asia Subregional Economic Cooperation (SASEC) aims to develop a multimodal transport network and transport corridors in the region to facilitate foreign trade between Bangladesh, Bhutan, India, the Maldives, Nepal, and Sri Lanka. In the South Asian region near 70% of freight is moved by road. Website: South Asia Subregional Economic Cooperation (SASEC).